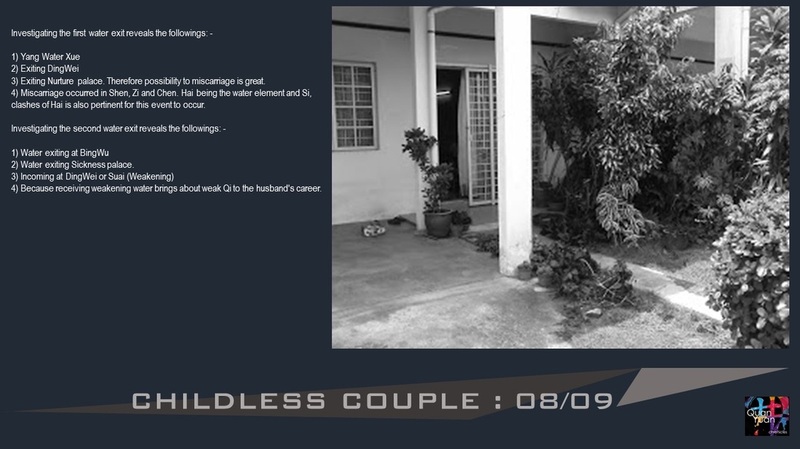 1) My wife and I are childless, due to two miscarriages. 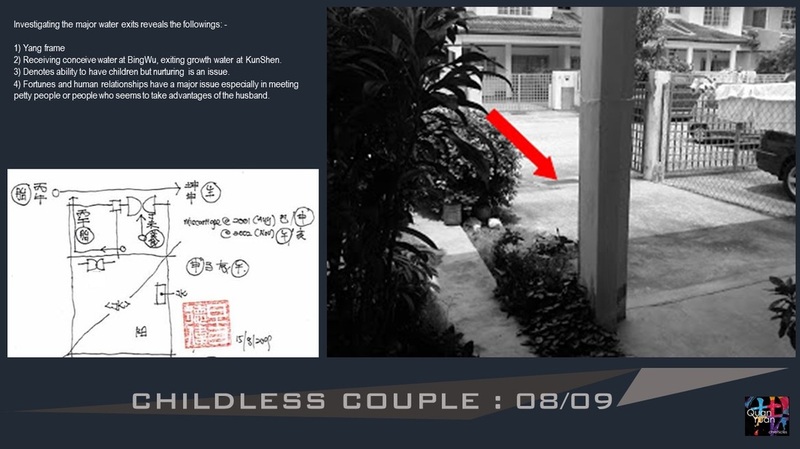 Are we fated not to have a child? Even adopting (illegal way) many years ago met with obstacles ie. the authorities were clamping down on the activity. We, especially me, occasionally get depressed of the current (childless) state we are in. 2) Am I cut out to run a business? I would like to venture into the pet industry ie therapeutic services. Otherwise, what business would be suitable? Or am I destined to be an employee? 3) I tend to meet people who are not sincere, back stab, or those who are opportunist. Is it me who is having problem mixing with people? I am currently in the sales line, and have no communication problem with my customers. 4) A medium once said that the house I am staying in (south facing) has a lot of "fire". I am short tempered by nature, but I find it hard to control it. Maybe I am not trying hard enough, or is the house "too hot" for me? 5) Health wise, which part of my body should I be taking care of most? Born Yi wood at the end of autumn season. Not supported by Earth and neither is supported by Heaven. Technically speaking, this is a true follower chart, favoring fire and earth. Most fear of resource, water and self, wood. Authority could have been favorable, but because there is another output that will eventually keep his authority at bay, unless wealth is there to arbitrate, but is not seen. Heavenly clash of Bing and Ding and earthly harm in Xu and You among the self, parents, ancestor and children palace summarized part of the reasons of being childless and emotional stress that reach beyond the couple and also the immediate family. 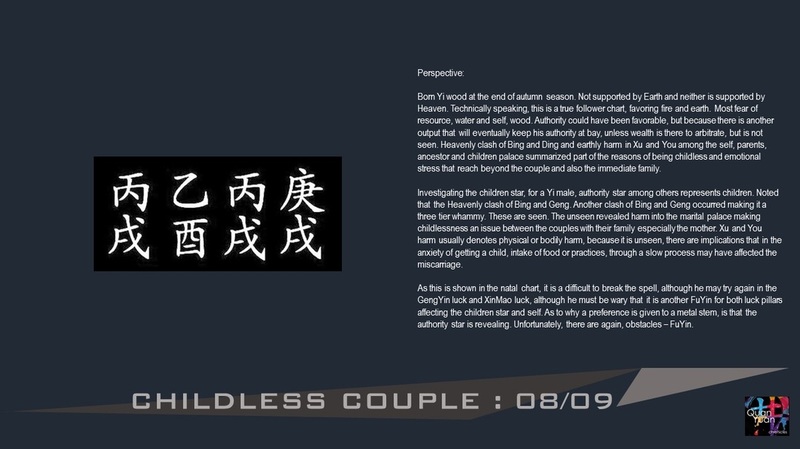 Investigating the children star, for a Yi male, authority star among others represents children. Noted that the Heavenly clash of Bing and Geng. Another clash of Bing and Geng occurred making it a three tier whammy. These are seen. The unseen revealed harm into the marital palace making childlessness an issue between the couples with their family especially the mother. Xu and You harm usually denotes physical or bodily harm, because it is unseen, there are implications that in the anxiety of getting a child, intake of food or practices, through a slow process may have affected the miscarriage. As this is shown in the natal chart, it is a difficult to break the spell, although he may try again in the GengYin luck and XinMao luck, although he must be wary that it is another FuYin for both luck pillars affecting the children star and self. As to why a preference is given to a metal stem, is that the authority star is revealing. Unfortunately, there are again, obstacles – FuYin. 3) Exiting Nurture palace. Therefore possibility to miscarriage is great. 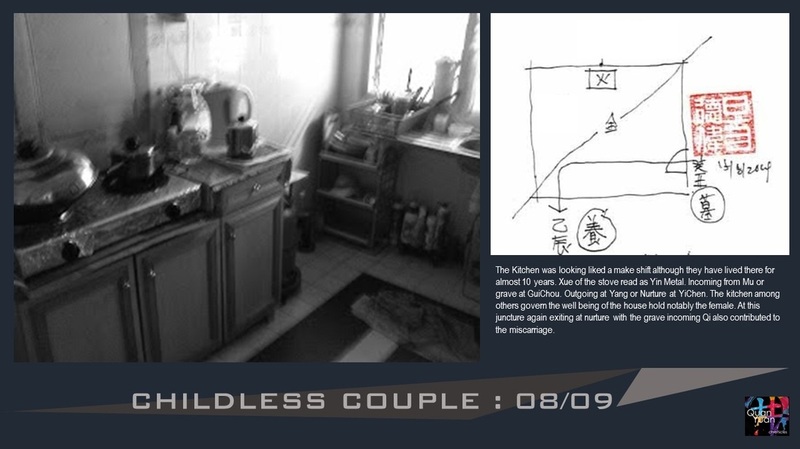 4) Miscarriage occurred in Shen, Zi and Chen. Hai being the water element and Si, clashes of Hai is also pertinent for this event to occur. 2) Water exiting Sickness palace. 4) Because receiving weakening water brings about weak Qi to the husband's career. 2) Receiving conceive water at BingWu, exiting growth water at KunShen. 3) Denotes ability to have children but nurturing is an issue. 4) Fortunes and human relationships have a major issue especially in meeting petty people or people who seems to take advantages of the husband. Husband complains about difficulty in sleeping. 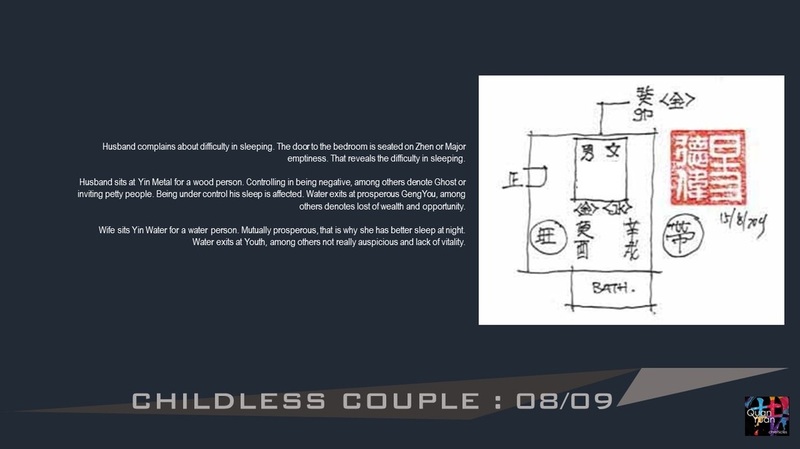 The door to the bedroom is seated on Zhen or Major emptiness. That reveals the difficulty in sleeping. Husband sits at Yin Metal for a wood person. Controlling in being negative, among others denote Ghost or inviting petty people. Being under control his sleep is affected. Water exits at prosperous GengYou, among others denotes lost of wealth and opportunity. Wife sits Yin Water for a water person. Mutually prosperous, that is why she has better sleep at night. Water exits at Youth, among others not really auspicious and lack of vitality.